The teachers and staff at the School for the Blind. For all parents of children who attend local Thai schools here in Pattaya, they will know that Wai Khru falls on any Thursday in June. 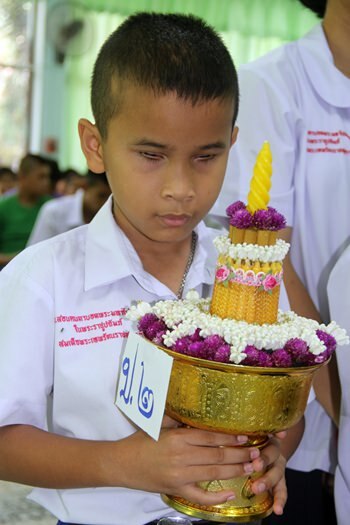 Wai Khru is the day when students pay their respects and show their love to their teachers, and the blind and visually impaired students held their ceremony on the final Thursday of the month, exactly two weeks after the visit by Her Royal Highness Princess Maha Chakri Sirindhorn, who is patron of the school. 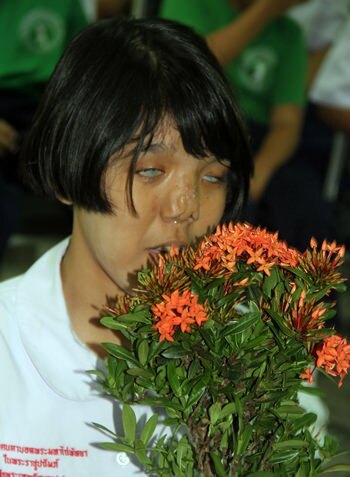 From each class, from kindergarden to grade 9, two representatives came forward and presented a beautifully decorated floral arrangement and a live plant to Khun Chid, principal at the school, and also to their own teachers. Many former students returned for the ceremony, traveling long distances to meet their former teachers. Several former students who returned for the ceremony are older than all the current teachers, but they came to pay respect for what they are doing for the current students. Not only did the teachers receive gifts from their students, but all staff also received a brooch to commemorate the recent royal visit to the school. 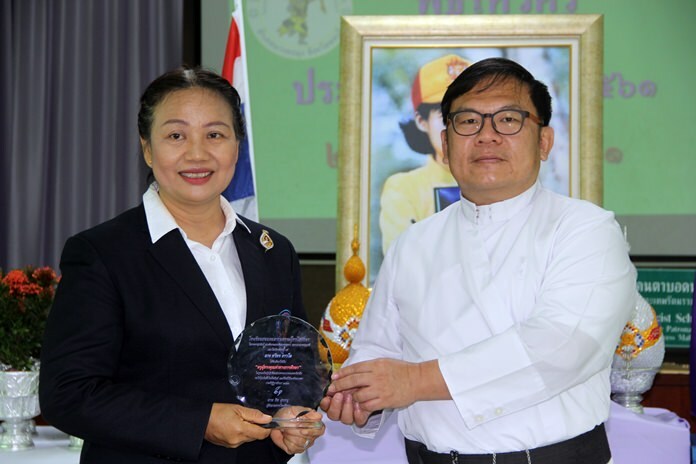 Father Wiboon Limpanawooth, Vice President of the Father Ray Foundation presented a special award to Khru Taweeporn for her dedication to the students, and the ceremony ended with the students singing a song to thank their teachers. Receiving a brooch donated by Her Royal Highness. Khun Chid accepts the gift from the children. Returning students, some older than the current teachers. It takes many hours to produce their gift. A plant for all teachers.